Perceptive Hollywood historian and biographer Higham (Howard Hughes, 1993, etc.) tackles one of Tinseltown’s most notorious unsolved crimes. 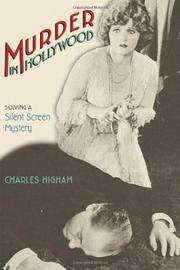 The murder of silent-film director William Desmond Taylor on February 1, 1922, has fascinated writers, film buffs, and journalists, Higham included, for decades. Many books, articles, and even a now-defunct publication called Taylorology have covered the story. One reason for the interest may be that none of the suspects, or the victim, could in any way be described as “usual.” Nearly everyone in the case packs a revolver. Taylor, his film career peaking, led a double life as a closeted gay man (clues in his bathroom included a woman’s nightgown) and the brief, indifferent lover of actress Mary Miles Minter. Did an obsessed Minter rub out Taylor after he eventually spurned her passionate declarations of love? Or did Minter’s mother Charlotte, who makes Gypsy’s Mama Rose look like a nun, shoot Taylor to keep him away from her daughter? Did Taylor’s male lover do it out of jealousy over Minter and Taylor’s tepid affair? Or was the culprit cagey Edward Sands, a cook who had already robbed Taylor? Drawing on unpublished documents compiled by director King Vidor, and making witty, insightful comments as he does, Higham cuts through a thicket of suspects, motives, and cover-ups to point the finger where it had rather clearly been pointing all along, arguing that for some years a hypocritical, moralistic press did its best to point the finger in other directions. More than the solution, what impresses here are Higham’s portraits of Taylor, Minter, et al., as scarred souls who believed Hollywood would be their Lourdes on the Pacific. They were mistaken. Wide-angle vision places a colorful cast of characters in meaningful relief against nascent Hollywood, politically corrupt LA, and the dysfunctional American family.